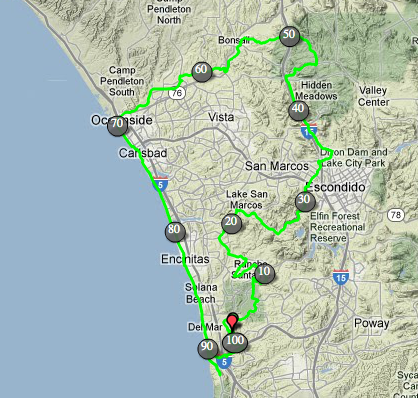 This last weekend was the ADA's Tour de Cure in San Diego. I signed up to ride the century with two good friends Blair and Tammy. We rocked our IN kits and rode for "Mile 23", a foundation that came out of the tragic death of two kids with diabetes. Here is a map of the route. It was nice, warm and sunny in the Hidden Meadows area then cold, foggy and windy along the coast. Jamie rode in the 30 miler training for her race in early May. She rode with a good friend of Insulindependence, Ryan Maloney (check out his Facebook fan page here). It was the first time he has ridden on real roads and not just a bike path, which is nerve racking no matter how old you are here is Southern California. It's sure not Rudolph Road in Eau Claire where my first Schwinn got its gears turned about the same age as Ryan.